Chennai: The apex medical regulator has ordered the removal of the name of a Tamil Nadu based general surgeon after he was found presenting himself as a faculty member in two medical colleges in the state during the same academic year. As per the recent news reports, MCI has written to Tamil Nadu Medical Council, to remove the name of Dr R Muthu Kumar, a senior general surgeon in the state medical register for a period of six months, since the date of notification. This came after the ethics committee of MCI found that the doctor had presented himself as a faculty in two medical colleges within the same academic year. The first case was at the MCI inspection of Annai Medical College and Hospital at Pennalur in Kancheepuram, where the doctor first presented himself as a Professor of General Surgery on December 2014. Later he is reported to have presented himself as a Professor of General Surgery at SRM Medical College and Hospital, concealing the information that he appeared as a faculty member of another medical college during the same year, reports TOI. However, during the correspondence with the ethics committee, Dr Muthu Kumar informed that he joined SRM Medical College as Annai Medical College, did not get MCI approval for admitting students during that academic year and that he was not aware of the MCI rules. The committee, however, did not agree in favor of the doctor, concluding that the primary responsibility to read the declaration before signing it falls on the faculty itself. The declaration form states, “I have not presented myself to any other institution as a faculty in the current academic year for the purpose of MCI inspection,” and assures that all the details are correct. 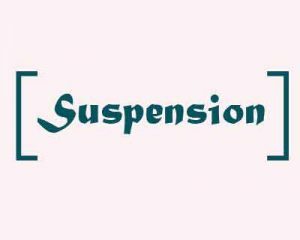 The committee further added that a wrong declaration can be “treated as gross misconduct thereby rendering the undersigned liable for necessary disciplinary action” and ordered that the surgeon be suspended for six months from the date of notification. In this regard, MCI has written to the sate medical council. Since medical practitioners are registered primarily with the state councils, it is the state councils which will first remove the name, following which the name of the will be taken off from the Indian Medical Registry, informed Dr Senthil, President TNMC. TOI further reports that if the state medical council acts against the practitioner for false declaration it will be a first, adding a previous case in 2012, when MCI had asked the state council to bar 4 doctors for declaring themselves as full time faculties of self financing colleges. However, the state council did not take action stating that the information provided by MCI was inadequate. Senior Dr ? 2 to this. The State Medical Council is not bound to follow the order of the MCI. There are lot of examples of this in coordination. The MCI can not take any action against any office bearer of the SMC, even if it\’s specific order is just ignored by the SMC. Being professor he should know the MCIRules.It is his primary duty to know the rules.That is why standard of medical education is going down because pvt. Medicsl colleges keep less staff resulting poor quality of education in India. Correct in penalising doctor but why is the management let off scot free ??? MCI HAS HAS TAKEN THIS NECESSARY ACTION AGAINST ONE INDIVIDUAL.WHAT ABOUT THE REST COLLEGES THEIR MANAGEMENT AND THESE SO CALLED FACULTIES . A PVT MEDICAL COLLEGE IN CHHATTISGARH INVITES FACULTIES FOR SINGLE DAY PAYS THEM HEAVILY AND GETS PERMISSION TO ADMIT STUDENTS SINCE LAST 4 YRS .IS MCI NOT AWARE.